We’d love your help. Let us know what’s wrong with this preview of Gifted by Patrick Evans. Below, in my earlier review, you have it: the proof that I was happily persuaded, via a narrative I knew was fictional, that I 'understood' Frame more thoroughly than I did before reading Gifted. This type of (in my case willing) delusion is just one of the reasons for the recent outraged and abusive post by Pamela Gordon, Frame's niece and the executor of her estate. I don't think 'cultural appropriation' is a crime, unless the new artefact is devoid of any meaning, for example car manufacturers' use of Maori designs. What do we now think of any royal objections to Shakespeare's use of actual kings & princes in his history plays? Gordon also objects to Frame being 'only 7 years dead'. I don't think that makes any difference. Time is a random factor, and apparently much more flexible than we have thought: it's only time that separates us from ancestors with whom we share nearly all of our genetic code. They are closer to us than we usually consider: does that mean we can't reinvent them? Would Gifted be OK if no-one could remember what Frame was 'really' like? Would we then be allowed to reinvent her? If yes, then why not now? If no, then what's the difference between that and being unable to cartoonify the prophet Mohammed? Gordon accuses Evans of portraying Frame as 'deceitful, dishonest and inhuman', which makes me doubt that she has read the book at all. For a start, Evan's Sargeson is far harder on himself than he is on Janet. He, who knows exactly what he's writing (a knowingly fallible narrator), shows himself up to be sometimes intellectually and emotionally limited, contradictory, often petty (and despite all that, deeply sympathetic). What does Frame do, in the novel, that makes Gordon think that Evans has depicted her as such? Hide under the hedge? Give him evasive answers? Tell him that she's doing something other than going to the shops, then go to the shops? I really fail to see how Gifted is an attack on her integrity. Does Gordon mean that in life, Frame always behaved with utter consistency and reliability? She would have been very boring if that were the case. And so what if I do feel 'closer' to Frame than I did previously, and if my Frame is not the same as the 'real' Frame? I *did* realise that Gifted is fiction, and that my 'understanding' of Frame is actually in some imaginative world, some kind of mirror city I guess, but (despite the biographical evidence that Frame was keen not to have the facts of her life misrepresented) I do feel that her writer self might have approved of and understood: after all, we all get a deluded idea of who a writer 'is' just from reading their books. If this is true, then it is a weird claim, but not one worth getting upset about. A work of art stands apart from its maker and the maker's ego. I reckon it has a separate consciousness and cannot be discussed in relation to the maker himself (which is why interviews with writers of fiction are such a diverting nonsense). I do believe that the ego is not very much concerned with creating. If it is, the art it creates usually doesn't work very well, and / or isn't very interesting or longlasting. In any case, whatever Evans says about Gifted, and whatever his motives were in writing it, has nothing to do with the merits of the book. It's White who uses the word 'channelled', and it's in relation to the Sargeson character, not Frame. I couldn't find any other online interviews that referred to channeling. Dunno if anyone'll read this, but I'm happy to engage. Would rather not be called 'vindictive', 'immature', 'mediocre' or 'pisspoor' [etc] though. I'm loving being tangled up in this book. It's as though, even when I'm not reading it, Frank Sargeson is at my side, gossiping and philosophising into my ear. I have to keep reminding myself that it's fiction (though actually I don't very often, as I love the delusion) because, probably aided by the knowledge that Frank and Janet were 'real', part of my brain does believe the book contains Frank's memoir. this is a very enjoyable read that brings to life two of new zealand's most famous writers, laced with humour and literary references. the characters of janet frame and frank sargeson are skillfully and richly created through their language and actions - it's a work of fiction, but anyone who has read something of either writer will recognise them. 1950s New Zealand and a particular lifestyle from that time is also beautifully evoked. I discovered Kiwi author Patrick Evans while reading The Back of His Head from the longlist for the Ockham New Zealand Book Awards and enjoyed his humour so much that I hunted out a copy of Gifted to read as well. As Evans told us when he was featured in Meet a Kiwi author, Gifted and The Back of His Head are parts 1 and 3 of a trilogy drawn from his familiarity with the writing of Janet Frame. (No2 is yet to be written). Gifted is about her brief time living with the author Frank Sargeson (1903- I discovered Kiwi author Patrick Evans while reading The Back of His Head from the longlist for the Ockham New Zealand Book Awards and enjoyed his humour so much that I hunted out a copy of Gifted to read as well. As Evans told us when he was featured in Meet a Kiwi author, Gifted and The Back of His Head are parts 1 and 3 of a trilogy drawn from his familiarity with the writing of Janet Frame. (No2 is yet to be written). Gifted is about her brief time living with the author Frank Sargeson (1903-1982), said to be ‘the father of New Zealand literature’, because he was the first to write in the New Zealand vernacular. Now, the odd thing about Frank Sargeson’s entry at Wikipedia (viewed 28/2/16) is that while it lauds his literary legacy, it doesn’t actually mention the name of any of his books. (For that you need to go to his entry at Goodreads, where it seems that his books are highly regarded, at least by the Goodreads community). No, what the Wikipedia entry focusses on is his lifestyle, which was eccentric, to say the least, and which is what makes Patrick Evans’ Gifted so entertaining. Evans (rightly anticipating the outrage of Janet Frame’s literary heirs) is at pains to point out that only two of his characters were real people, i.e. Frame and Sargeson, and that the book is a work of fiction. But it does seem to depict Sargeson’s living arrangements with uncanny accuracy. Sargeson lived in what Kiwis call a ‘bach‘ and what Aussies would call a ‘shack’, a rudimentary dwelling which is a far cry from the stylish and capacious holiday houses that middle-class Aussies have today. Today tourists can visit Sargeson’s Bach, but it’s important to note that it was the second one he had on his parents’ land – the first one was condemned by the local council. Yet this site is a sacred site for KiwiLit because this bach, and the re-purposed army hut in the garden, became a hub for a new generation of Kiwi authors, of whom Janet Frame was one. 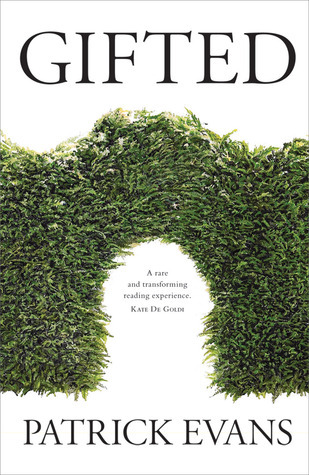 Gifted begins with the arrival of Janet Frame at Sargeson’s bach brought there by her friend Molly, who says she needs somewhere to develop her talent – to get back on her feet. But either Frank hasn’t been listening properly (a propensity of his) or Molly is evasive, because it takes months for him to learn where she’s been. I sometimes worry about authors trying to inhabit real characters. However, with this book I had to keep reminding myself that Frank was actually Patrick, for two reasons. Firstly, Evans seems to have a real affinity for and understanding Sargeson and his time. Rarely do the colloqialisms and the setting feel contrived. This is a book that feels very set in its time, the fifties, at the emergence of a sense of New Zealand literature beginning to have a place and validity. Sargeson, as Evans has h I sometimes worry about authors trying to inhabit real characters. However, with this book I had to keep reminding myself that Frank was actually Patrick, for two reasons. Firstly, Evans seems to have a real affinity for and understanding Sargeson and his time. Rarely do the colloqialisms and the setting feel contrived. This is a book that feels very set in its time, the fifties, at the emergence of a sense of New Zealand literature beginning to have a place and validity. Sargeson, as Evans has him ironically self-quote, reminds us that he is the 'Father of the nation's fiction' several times throughout, although he is self-deprecating and talks about 'cobbling' bits of writing together to create stories. I also think that the book gives a fresh view of Frame; one that is not (apparently) blurred by time and more modern understandings of mental health in general and schizophrenia in particular, since the book was apparently penned (fictitiously by Sargeson) in 1955. While Frame remains interestingly peripheral to the story of 'Gifted', the exploration of her writing, and of her view of the world, and of her view of language, while mediated by Evans and Sargeson, makes me want to read 'Owls do Cry' again. The story here of an established writer giving shelter to a gifted but troubled would-be writer is full of lovely human tangents and philosophical hickups. Janet Frame's was not the sort of mind that Frank expected to be assisting, and Evans has beautifully sculpted a disruptive and challenging meeting (and not-quite-meeting) of minds and world views. My struggle though was in the wordiness of it as the author attempted to create a time and style suitable to represent the voice of 'the father of The story here of an established writer giving shelter to a gifted but troubled would-be writer is full of lovely human tangents and philosophical hickups. Janet Frame's was not the sort of mind that Frank expected to be assisting, and Evans has beautifully sculpted a disruptive and challenging meeting (and not-quite-meeting) of minds and world views. I have heard in passing Janet Frame but am totally clueless about Frank Sargeson, the father of New Zealand fiction. This novel had a wonderful grounded, earthy quality to it. You can almost feel the salty air from the sea flowing between the pages. There are no literary pyrotechnics in the proses and it reads well, almost well-mannered. Honestly the best New Zealand novel I've read in years. Patrick Evans lives in Christchurch and has taught New Zealand literature at the University of Canterbury since 1978.